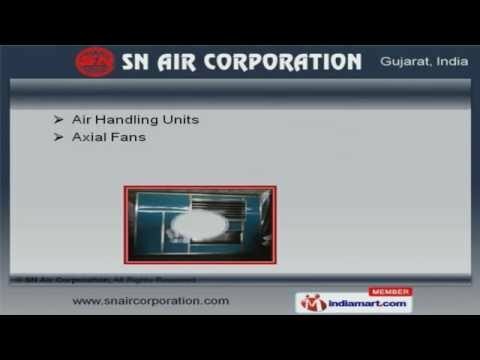 Welcome to SN Air Corporation, Manufacturer and Supplier of Industrial Equipments. An ISO 9001 2008 certified company, incorporated in 1975 at Ahmedabad. We Cater to Food, Textile, Automobile and other industries. Clarke Energy India Private Limited and Fair deal Filaments Limited are some of our esteemed clients and we backed by cutting edge technology and industry leading prices. We offer a wide assortment of Industrial Application Equipments, Evaporative Cooling Pads and PVC Diffusers. Our Air Handling Units, Centrifugal Exhaust and Backward Curved Didw Fans are a class apart. We also provide Cooling Blowers, Duct Accessories and Aluminium Ducts that are available at industry leading prices. We are instrumental in offering a wide array of Water Chillers, Cooling Pads and Mist Louvers that are cost effective. Industrial Air Washers, Humidification Systems and PVC Sheet Box Type for Eliminators are widely acclaimed in the market. Our Centrifugal Exhausters for Chemical and Tubeaxial Fans for Industry are widely demanded in the market.